Last week was such a busy one! Michael was dealing with fixing the car and stuff from the break-in. It ended up being a bigger hassle than we expected. Not only did no shops in Portland have the specific glass window for his car, but when they ordered it and tried to install it last week, they ended up referring him to a body shop to finish it. What a mess!! Despite that, I had a pretty good week. I got to see some friends I hadn’t seen in awhile because of all the drama and the wedding planning appointments we had. I feel bad for neglecting my friends! 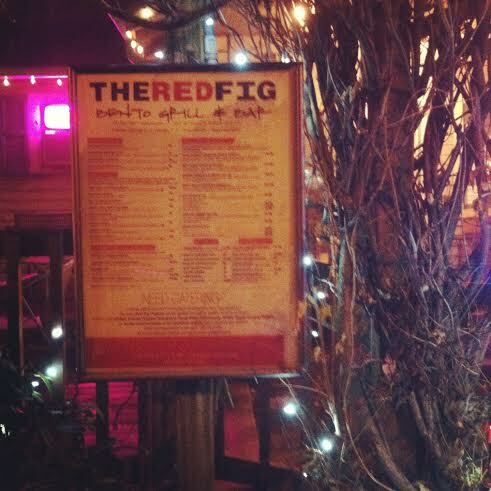 I met my great friend Robyn at The Red Fig for dinner. I had a Groupon deal for it and had never been there before. It sounded like an interesting menu. I headed over after work; the night was really dark and the fog was thick. The kind of fog that makes it difficult to see much in front of the car. I drove through NE Portland, not too familiar with the area, and after driving around in circles a little but, finally found it. The restaurant was really cute! It looked like it was in an old craftsman style home that had been remodeled into a restaurant. 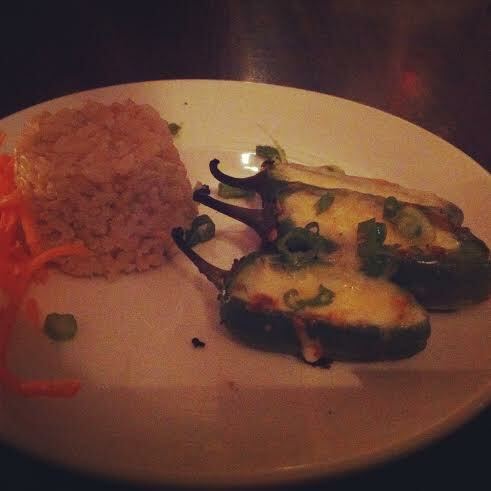 It was still happy hour for a few minutes so we ordered some jalapeno poppers. I was not a fan. They weren’t what I was expecting and I kind of prefer Michael’s. The jalapenos were cut in half and then filled with melted cheese. Sounds pretty good, but fell flat. The menu sounded really good. There were a lot of things that appealed to me, especially the Thai Peanut Chicken Pasta Salad but it was such a cold, gloomy night that I wanted something warm and not a cold salad. 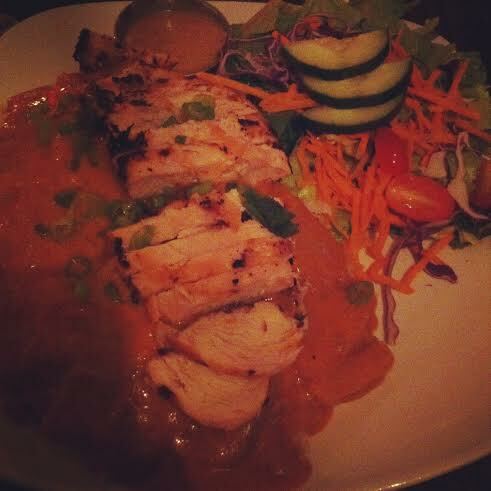 I ordered the Panang Curry dish with chicken. It wasn’t very spicy, which was disappointing. It could have used some bite. But the flavors were really subtle and delicious. The curry and the sesame/peanut flavors all worked well together. I ate half of my dish and saved the rest for lunch. It was a satisfying meal, even if it could have used some spice. We stayed long enough to hear some of the second band, Ask You In Gray , which I hadn’t heard of but loved! 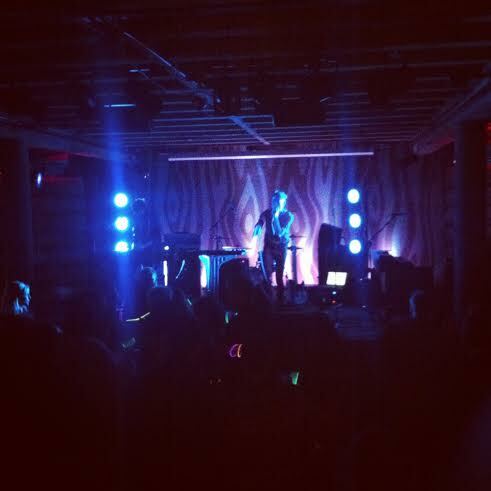 They were a duo and played like electronic-pop-dance-type music. They sounded a lot like Erasure. It was fun! But boy, was I tired by the end of the night. I met up with my other friend Erika at this bar in Woodstock. 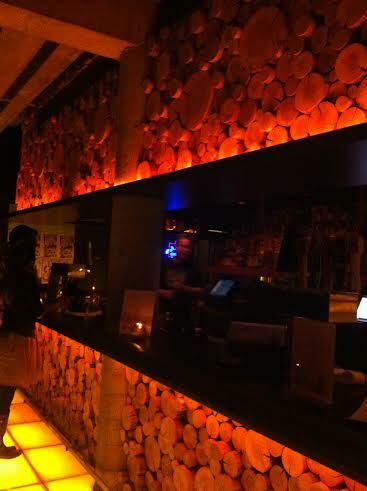 I’d never been to it, nor heard of it, but it was a cute divey-type bar that looks like it used to be an old diner. 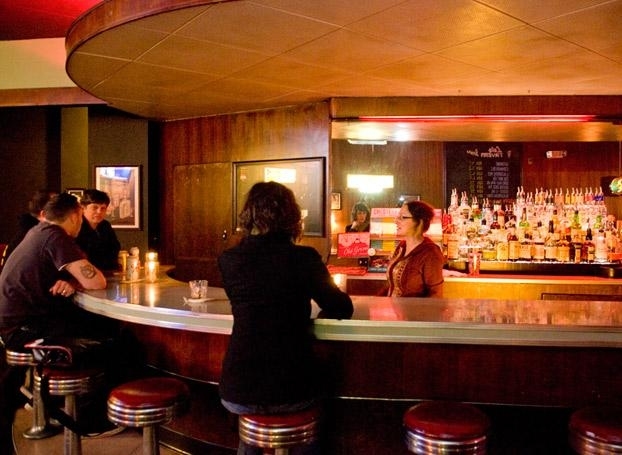 It had diner-style seating at the bar and comfortable booths, plus a pool-table and jukebox. It wasn’t very crowded when we got there but it filled up fast and seemed like it was a popular neighborhood joint. They had a great beer list. I was super excited that they had my favorite beer on tap, Boneyard IPA. I happily got a pint. It’s been ages since I’ve had it. They also had Omission (gluten-free beer). 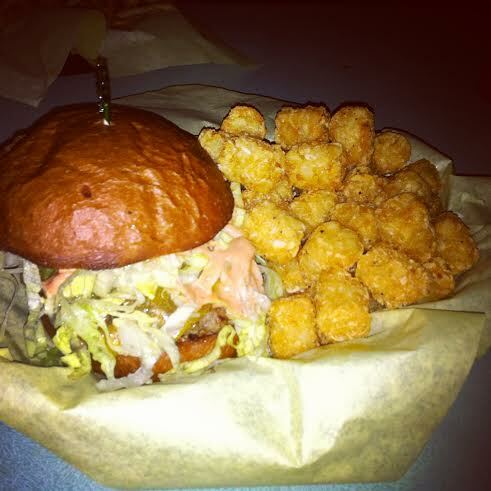 I got the Lutz Burger with tots. The tots were probably the best I’ve ever had. They were perfectly cooked, not mushy on the inside and the outside was crispy and delicious–almost like a fried chicken exterior. The burger was pretty darn good, too, and it was only $8. I’d definitely go back here for some beers and burgers. I also got the best present. 🙂 My VERY OWN BIG CARL! Sounds like you had some tasty outings! I bet the kid would have loved the tots! LOL Big Carl is awesome. 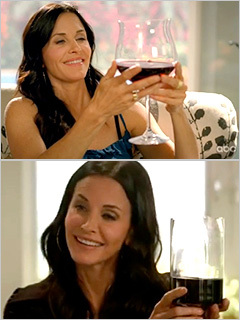 Now that’s a wine glass you can crawl into! 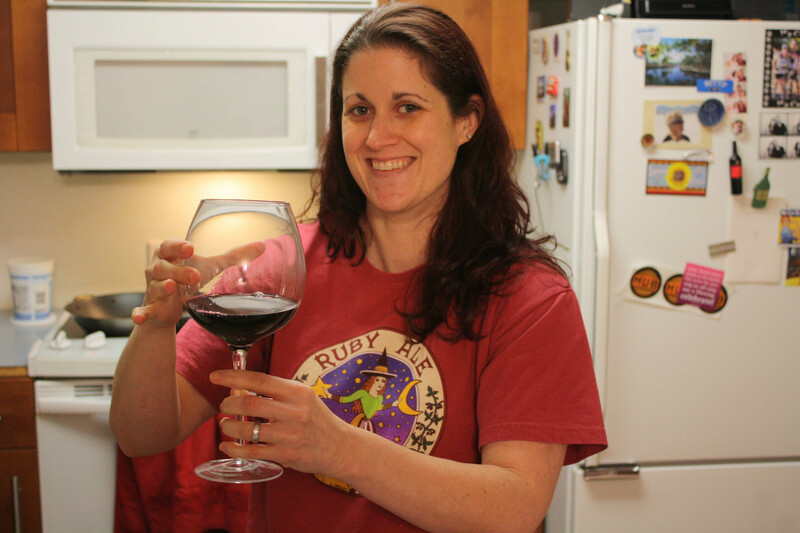 AKA The best kind of wine glass! Haha, Big Carl is too funny! Sounds like an awesome weekend! Hi Lisa! I just discovered your blog and boy am I glad! You have the same philosophy as me in regards to weight loss, and it’s worked for my first 40lbs off. I’m stuck in a rut now and looking for inspiration and motivation to move forward – and you helped! Maren recently posted..Christmas time is such an amazing time! Congrats on losing 40 pounds! That’s great. Ruts are hard. I hope you can get unstuck!